Best Thing on the Menu celebrates cherry blossom season and this week’s Sakura Matsuri festival by calling attention to a roll of perfection. The roll comes to us from Hashi Sushi, a quaint two-story sushi joint in Georgetown that blurs the lines between traditional-style sushi (think slab of fish on rice) and new American sushi (think crazy rolls). They also offer ramen, which is certainly trending in DC right now, as those of you know who have stood in long lines at Toki Underground, Daikaya and others. The Best Thing on the Menu: Cherry Blossom Roll contains shrimp tempura, spicy tuna, kaiware and seaweed salad. 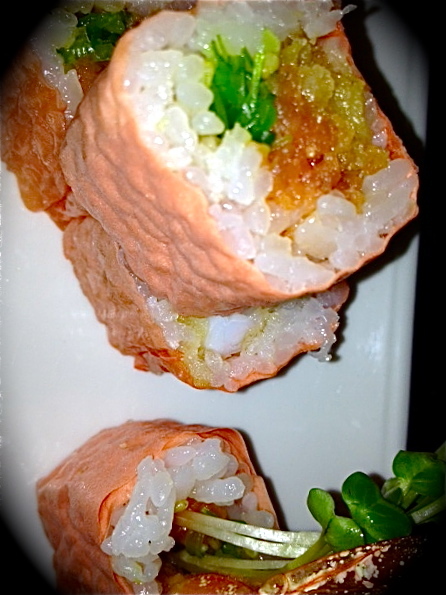 It is wrapped in an appropriately-pink soybean sheet and served with sesame sauce. The roll is unique in that you’re substituting a a soybean sheet for black nori and substituting soy sauce for a sesame vinagrette. It is a welcome alternative to the offerings at the Sakura Matsuri festival, which often consist of fried noodles and chicken satay disguised as Japanese food. Though having recently lost their Osaka-born sushi chef to another restaurant, the roll quality at Hashi Sushi remains undisturbed. Cherry Blossom Roll not your BTM? Post your favorites in the comments section. This entry was posted in Restaurants and tagged Best Thing on the Menu, BTM, Cherry Blossom, Hashi Sushi, Kaiware, Ramen, Shrimp tempura, Sushi. Bookmark the permalink.